Although we now have sixty active members, we are always looking for new members to swell our ranks and to replace the few who have to leave us for one reason or another. We will give a warm welcome both to experienced singers and to those who have always wanted to take up this rewarding hobby, but have never had the time or “courage” to try. We have members from Exmouth, Sidmouth and Seaton, Ottery, Honiton, Exeter and as far away as Crediton and Cullompton. COME ALONG AND FEEL THE BUZZ! By joining the choir you will have a hobby that is enjoyable; a chance to meet new friends; has a bit of a challenge; and contributes towards local and national charities. Furthermore the health and well-being benefits are well documented. We rehearse at The Peter Hall every Tuesday evening starting at 7.30 pm (prompt) and ending at 9.30 pm. The Peter Hall is behind St Peter’s Church, The Lawn, Budleigh Salterton, EX9 6LR - click here to view a map. It is very easy to join us! LISTEN to the different types of songs that we sing. LEARN about the four harmony parts (1st Tenor, 2nd Tenor, Baritone, Bass). JOIN IN AND SING – feel what it is like to be part of a large choir. 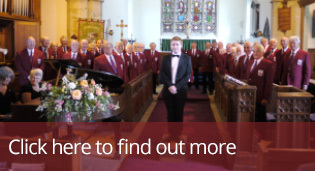 CHAT TO MEMBERS of the choir and find out what we do. If you join us you will be given the appropriate guidance (depending on your previous experience) and should be “on stage” at concerts within two to four months.